Looking for the selection of the best comforters in the market this year? Worry not anymore. We compiled a brief but quite complete list with some of the best quality and best sold comforters, including sets with other bedding pieces to complement the bed, as well as versatile items that are available on several different sizes. It doesn’t matter if we are in the cold season yet or not, purchasing a great comforter is something that you can use all year along either for the outlook, comfort, or both and more. Check the products that made our list as well as some tips to know the best items of this kind and what you cannot miss about them when purchasing a comforter. Here we have a complete set developed by Chezmoi, not only with a great comforter, but also with shams, bed skirt, cushion, neck roll and even a breakfast pillow. The 7-piece manufactured by Chezmoi is all made on 100% polyester, which is an affordable material that still offer a great insulating capability to trap heat and let you all warm under the blankets. You can find this set available on three different sizes: the Full, King and California King. The Full model here works well as a Queen size as well, but a bit shorter than the average Queen. Ultimately though, Chezmoi sells their sets as an ideal and fashionable blend of bold and vibrant colors to make your bedroom formidable. This set in particular is available on four different set of colors: the Burgundy, the Lavender, the Tan and the Orange. For last, the outer cover of the set with the comforter is made on microfiber polyester, which creates a very smooth, plushy soft touch. Alongside the comforter, you will get 2 shams, 1 bed skirt, 1 cushion, 1 neck roll pillow and 1 breakfast pillow. The clean up procedure recommended by the manufacturer is to wash the pieces on the gentle cycle of your washing machine and with cold water. It should sun dry and can be tumble dry on low potency. The next item of our list is as well a set that includes a comforter with the other companion bedding pieces that are essential for a great outlook over your bed and for the complete comfort of a good night sleep. Different from our first item, this Madison set has only its filling made of 100% polyester, while the outer cover is made of a 100% cotton, a very welcome material for the outmost layer of bedding pieces. The cotton makes all the pieces quite breathable for major comfort while you sleep and keeps yourself warm. The set features alongside the comforter, two standard shams, one bed skirt that is a mix of cotton and polyester, with a 180 thread count cotton drop over a 100 polyester platform, and there are still more three decorative pillows, either on square or oblong shape. Perhaps the greatest deal about this set is the beautiful print design. Madison makes use of warm colour tones of brown and blue for a vivid but delicate leaf, naturalist design. The border of the comforter is outlined with ivory details and the inner side is made on a solid blue cover. The three decorative pillows are embroidered in brown, khaki, and blue fitting the overall theme of the set. The comforter developed by LinenSpa here is a great item in our list, specially considering the tradition of LinenSpa on manufacturing outstanding bedding items, with minimal but sophisticated finishing and high quality materials. Not a coincidence they named this comforter a Down Alternative: LinenSpa knows there lies the best comforters in the market these days but delivers here an alternative that is paired to what is offered by down comforters. The manufacturer made a comforter that is designed on baffle boxes with a polyester microfiber filling. The fill power is quite up to the standards of goose down for example, and the outer cover is also made on the microfiber that resists wrinkling and is hypoallergenic. The sewn corner tabs ensure that the duvet cover stays in place.And as it usually happens with the LinenSpa items, this comforter has an elegant and minimalist touch, with double solid colors paired for the inner and outer sides, so you can switch the sides to have different outlooks as you please. You can find this comforter available on King, California King, Oversized King, Queen and Oversized Queen, as well as Twin and Twin XL and the Full sizes. The comforter can be clean up with a machine washing cycle and endures a dryer machine cycle as well. Here we have two slightly different versions of a concept for comforter set developed by Intelligent Design. The manufacturer developed two models of comforters with a mandala alike decorative design, with subtle matching colors. 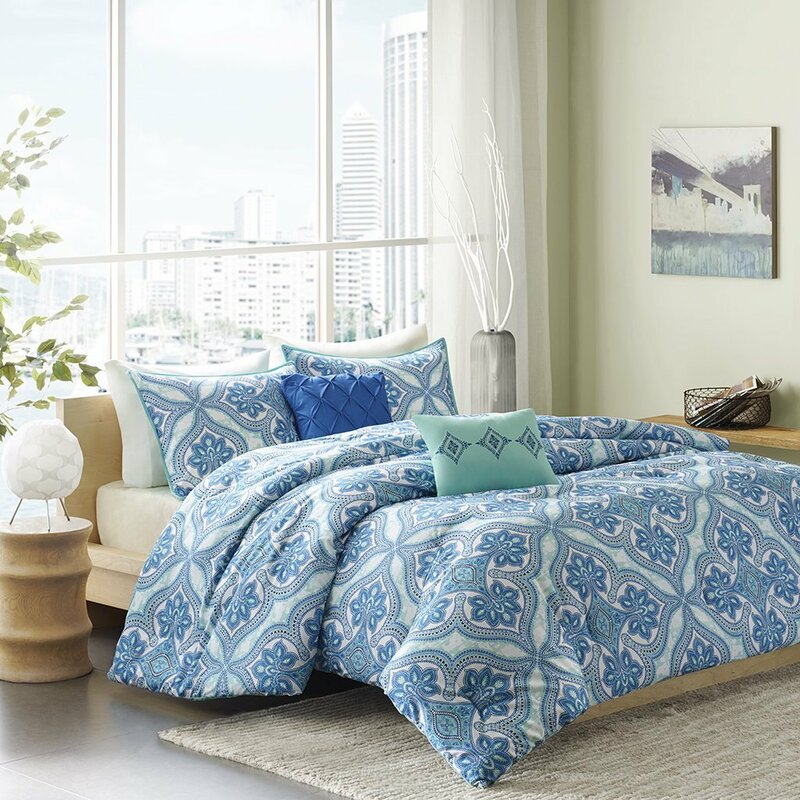 The Tanya 5 piece set offers a great, beautiful comforter with an embroidered alike print made on grey and white shades over a polyester microfiber cover. This set has a great outlook to match most decor sets with elegance and includes fitting extra pieces: two shams and two decorative pillows. All the set is made on 100% polyester, one more hypoallergenic item of our list. Alternatively, you can find a version of this Tanya set made on blue and white shades instead of the sober grey one. The whole set is available on King, California King, Queen, Twin and Twin XL as well as Full size. Like all the comforters already listed here, this one can safely washed on a washing machine cold water cycle and tumble dry. The Senna features the same materials and is available as well on the same sizes, but it features a more complex, Orient inspired embroidered design with extra shades of colors. Adding to the options of colors, the Senna is available either on blue and grey, black and grey and orange and grey. This next comforter is another set, a smaller, 3-piece one, that includes the standard two shams. Like the LinenSpa set, this is sold by Utopia Bedding as an goose down alternative comforter. The design of this one is a bit more contemporary and bold, even though the color schemes compensate for that with more neutral options, either Navy or Grey. A differential for this set is the use of a stronger stitching technique, with 2 inches flange for the shams for example and wider baffle boxes. The materials implemented here are as well polyester microfiber, in this case a brushed, solid and smooth outer cover fabric. And for the filling, this comforter makes use of 3D hollow siliconized polyester. You can as well wash it in the washing machine but only in cold and gentle cycle. You can find this set either on King, Queer or Twin sizes. The last comforter of our list is an alternative, elegant and beautiful alternative of a comforter if you are looking for something that goes beyond the baffle box stitching design. The Homemug features a pleat puckering design that, despite being quite simple, has an lavish, elegant final result. The comforter resembles refined bed cover blankets but still offers all the comfort and insulating features of a great comforter, so you do not have to do the bed with different layers, remove covers and lay them again by the morning, it is all in one here. The Pinch is available either on the sophisticated black finish or grey. The comforter is made on polyester and includes two shams. You can find the sets either on King or Queen sizes. What is the difference from a comforter and other covering bedding pieces? Different from a blanket or sheets, comforters are usually made of filling and air chambers overlapped and stitched inside a second outer cover layer. While blankets are one-layer-only bedding pieces, generally made of wool and other organic materials, the comforters have a more complex structure, and for doing so, they offer better heating capacities because they trap the body heat with more efficiency. There are many types of comforters, from top notch quality comforters made with goose down filling from comforters made entirely on cotton and other organic materials to mixed materials, with hypoallergenic synthetic materials like polyester as you have seen in our list. In a nut shell though, comforters are the best bedding pieces for cold seasons as they deliver the best heating quality and are in general much lighter than traditional blankets. What are the benefits of purchasing a great comforter? As we just said, comforters are absolutely the best heating bedding pieces, and you get that with an excellent cost on sleeping with a lighter piece covering you, as well as the materials here are easier to handle, clean and care for. You always have to take into consideration and comparison the only other alternative to comforters, the blankets so we will make a point by point comparison here so you can realize the advantages. Weight: The comforters feature materials that are light, this is not only useful to sleep comfortable, but also to handle the bedding piece. Many blankets made on long wool threads can be quite effective as insulating materials, but they are very heavy, which makes it very difficult to wash, hang and handle in general. Hypoallergenic: Consider that you can wash comforters easily on your washing machine and, by default, most of them already feature synthetic materials to avoid the proliferation of micro-organism from bacteria to fungus. Blankets are the terrors of people allergic to dust mites and most other allergens that love organic materials mostly used on blankets. Cost-benefit: Comforters are usually much more affordable because of the use of synthetic materials. You can also be a conscious buyer and opt for manufacturers that implement recycled plastic materials to craft the polyester. It helps your pocket and for sure the planet. Complete Sets: You will easily find comforters sold on complete sets, because that is a way for manufacturers to sell more at once, but also is a way for you to finish the bedding set at ease. Also, purchasing complete sets often delivers a lot of economy considering the items sold separately are often more expensive. What the best comforters feature? Insulating Materials: Either it is a goose down comforter or a simple polyester mesh, you have to be sure that the comforter is in fact a heating bedding piece as effective as it has to be. Note that to be sure about this feature quality, you have to look for the fill power rate of the comforter: the higher the better, while a decent comforter must rate over 750. Washing Compatible: Most comforters in the market can be washed one way or another, but is important that you find an item that is the best of both world when it comes to cleaning. You will not either want something that can be washed in all ways possible but that will wear down fast. Since comforters are large, they must be at least washing machine compatible and able to hang dry. Items that can be washed on warm water cycle and tumble dry are a plus that is always welcome. Aesthetic Versatility: Since comforters are large and prominent, you cannot unfortunately enjoy dozens and dozens of different pieces in your wardrobe like we usually do with sheets. Be sure to pick comforters that can please your aesthetic needs, matching easily the room and furniture. Sets that have way too much personality can become not that much useful and used. Do not pick something that is an event per se. The best comforters must be versatile while elegant and beautiful.